Positioning accuracy is a critical aspect of producing tight tolerance parts when cutting with an abrasive waterjet. The more precisely you can position the jet, the more precisely you can machine the part. 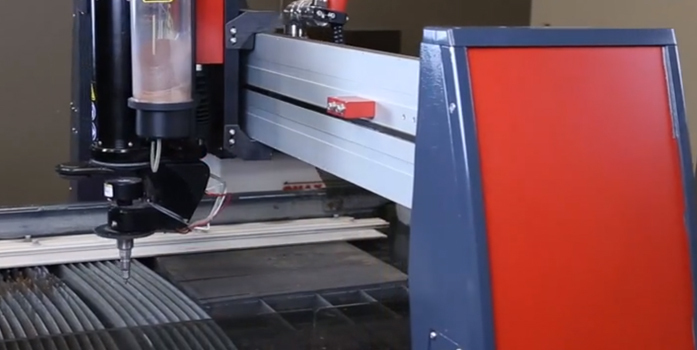 A motion control system positions the cutting nozzle along the X- and Y-axes of a waterjet. This system is comprised of motor and drive components, a controller and optionally a position feedback device. The motor and drive components make up the drive system. Several different types of drive systems are used in today’s waterjet machinery. Servomotor ball screw drives are the most common type of drives used in motion control systems for high-precision abrasive waterjets. Usually, the encoders within the motors are used as the position feedback device. Ball screw systems can be extremely accurate. However, their lubricated contact surfaces make them very sensitive to contaminants such as abrasive dust and water. If contaminated, ball screw systems can lose their accuracy. Rack and pinion systems and belt-drive systems are more tolerant of contaminants than ball screw drives and typically don’t require the sophisticated contamination protection that ball screw systems need. However, these systems simply aren’t capable of the precision motion required by today’s high-precision abrasive waterjets. Therefore, rack and pinion and belt drive motion systems are most often found on lower precision cutting machines. Traction drive systems incorporate a hardened steel drive wheel mounted to a movable carriage assembly that moves along a hardened steel rail, the same type of mechanism used in railroad locomotives. The drive wheel is rotated by a brushless synchronous motor, causing the carriage to move along the rail. Traction drive systems are extremely robust and well suited for wet and abrasive-laden environments. Traction drives provide smooth movement over many speeds and accelerations.They don’t require lubricants, which enhances reliability and reduces the time and money required for maintenance compared to other linear drive systems. Recognising the durability and maintenance advantages of traction drives, OMAX developed Intelli-TRAX, the first motion control system designed specifically for abrasive waterjets. Along with a traction drive mechanism that moves a carriage along a rail, Intelli-TRAX incorporates a magnetic linear encoder and an electronic drive control for precise positioning. The electronic drive control gives motion commands to the traction drive motor, thus providing the forces necessary to move the jet. A sensor on the carriage reads position data, at a location resolution of 1 micron, from magnetically encoded tape along the rail providing the necessary data for extremely accurate positioning. Intelli-TRAX has indeed proven to be the ideal motion control system for abrasive waterjets. The traction drive technology has improved waterjet cutting accuracy and also reduced machine maintenance.